It has been argued that Angel Cejudo, Maryvale could compare with P4P best ever in Arizona history but when you line up the accomplishments side by side, Roman Bravo is the Best to ever come from Arizona. I have known Roman since he entered into high school. Watching young man grow and accomplish what he has throughout the last 4 years has been a pleasure. This will be something we talk about for years to come. Roman has signed with Penn State University to continue his wrestling career as a D1 wrestler under coach Cael Sanderson. They say iron sharpens iron. Arizona is excited to see what there is to come from this young man at the D1 level. Sometimes when we watch these kids enter into high school and graduate, we tend to feel a little sense of goodbye. We have enjoyed being apart of your wrestling career in high school and will continue to support you as fans into your college career. Good luck Roman. You can watch Roman win his 4th state title below, please share with the community – this is still history in the making for the things to come from this young man. 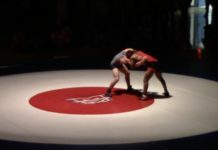 Congratulations Roman Bravo – 4X Undefeated Arizona State Champion.